As the 2015 CES conference fades (already!) in the industry’s rear view mirror, it’s worth recognizing how much occurs during CES week, but not at CES itself. Apple famously casts its long shadow each year, since Apple products are surrounded by a large halo of aftermarket offerings, but Apple (the company) had no overt presence in Las Vegas that week. But another company of similar stature does: AT&T, which begins its annual Developer Summit with a Hackathon during the weekend prior and concludes it with a conference, consisting of a keynote and breakout sessions on the Monday just prior to the CES opening day. 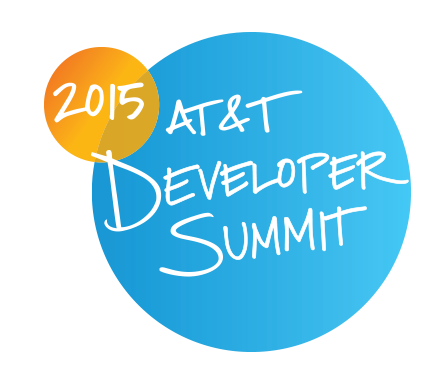 The 2015 AT&T Developer Summit, in its ninth year, had 4,000 developers in attendance. For the Hackathon, the attendees broke up into groups to create apps that followed the decidedly “mobile” themes of the event: mobile apps, the ‘Internet of Things’ (including smart homes and the Connected Car), WebRTC, atop the software-defined network (SDN) and network function virtualization (NFV). SDN and NFV are about defining the resources you want in your applications, and making sure that the network can provide them on demand. The conference keynote was opened by AT&T Mobile and Business Solutions President and CEO Ralph de la Vega, who exclaimed that “Mobile is eating the world!” (riffing on the famous 2011 “Software is eating the world” article, about how old-school hardware companies like HP are turning toward software to help ensure their futures). Mr. de la Vega then explained how the combination of software, mobility, the cloud and security have already disrupted many industries, changing the way consumers live and work by creating ecosystems that connect secure end points to a secure VPN. Uber is the obvious example. In an ‘Internet of Things’ (IoT) panel later in the keynote session, Glenn Lurie, now CEO of AT&T Mobility, elaborated that “Any device that’s connected is smart, and if it’s not connected, it’s dumb,” and that AT&T’s goal in the IoT space is to connect to any kind of device or customer, whether it’s an individual or a city; a network of street lights, or a consumer’s automobile or smart watch. With that context in mind, Mr Lurie’s panel had a wide-ranging discussion. Panelist Steve Mollenkopf, CEO of Qualcomm, unsurprisingly believes that a fundamental quality of IoT will be mobility. Benedict Evans of the investment firm Andreessen Horowitz believes that IoT will be a bigger opportunity than mobility, the PC, and software. Cisco’s Chief Technology and Strategy Officer, Padmasree Warrior, said that now that it is in place, is commerce-enabled and is social, IoT is the next logical step in the evolution of the Internet. Alex Hawkinson, CEO of SmartThings, a ‘smart home’ technology company, added that the key to IoT is to make devices and use-cases simple, accessible, easy to use, and to be sufficiently open to enable walled gardens that provide opportunities for innovation. The panelists agreed that there is no single unified trend in IoT because it’s so diverse. The most interesting things will happen at the edges of networks, but the availability of connectivity and bandwidth will limit how much ongoing communications will take place, and therefore, how much of the experience will actually need to be available within a given device if the connection can’t be guaranteed. There must be a balance between them to best leverage both. Devices will become so cheap and so useful that they will be everywhere, but they will need software and networks to enable the use-cases. Security was another area of discussion. Last September, a Hewlett-Packard report said that 70% of IoT devices lack security. In order to accommodate security, several things will need to change. First, security must become appropriate to the use-case, and less of a ‘point product.’ For example, DRM for video and data security for health care applications are very different. Yet, an AT&T consumer might have the need for both within the same account relationship. Also, there is already a simultaneous need for security and privacy: data is collected about a device user, but it must be kept anonymous – often for regulatory reasons. In all, the Internet will be called upon to enable an increasingly diverse and personalized experience. There will be more end-points, so the architectures of networked applications and devices will have to accommodate that. There must be distributed intelligence that functions in realtime and, from moment to moment, recognizes that an end user’s device or data may be vulnerable to attack, and decides when to implement security from the cloud and when to invoke it local to a device. This discussion seemed rather remote from AT&T, but the opposite is true, since AT&T already offers a home security and home control service (AT&T Digital Life) and is trying to drive adoption against entrenched competition like ADT. In addition to AT&T’s strategic initiatives into the Connected Car, where AT&T offers a global automotive telematics platform in partnership with in-country communications carriers in virtually every market where automobiles are sold. AT&T’s NetBond platform provides APIs that enable developers and enterprises to create virtualized applications that integrate AT&T’s network with cloud partners that include SoftLayer, CSC, Amazon Web Services, VMWare, IBM and Microsoft Azure. But this was a Hackathon – what happened? Developers participating in the Hackathon had 48 hours to put together apps using the AT&T network platforms and APIs. Many teams formed, from which 20 teams were selected for further evaluation by AT&T, which eventually resulted in three finalists. The winning team won $25,000, and was presented with a check on the spot. “Anti Snoozer” used AT&T APIs to enable a application to help prevent drivers from falling asleep at the wheel. 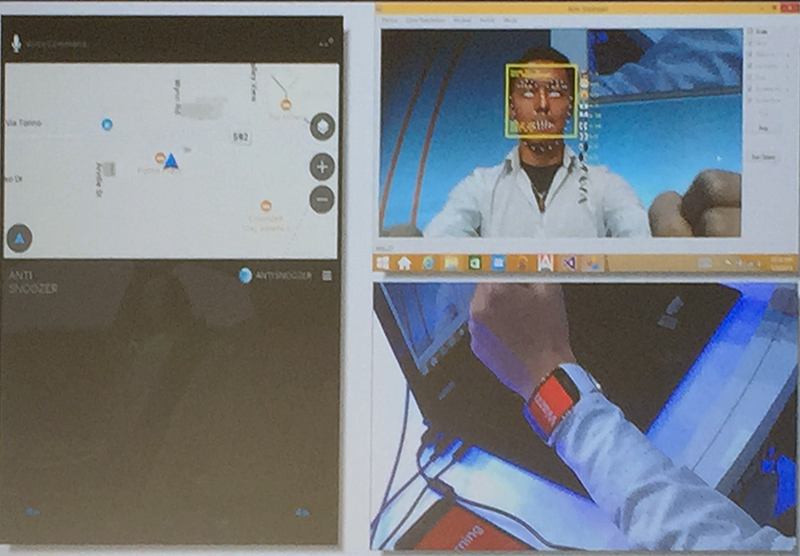 Anti-Snoozer, the winning app, utilized AT&T’s Drive APIs, a camera, and motion-sensing to monitor the driver’s position and the dilation of the driver’s pupils to sound an alarm to awaken a drowsy driver (presumably, for long enough to find a place to pull over or stay). The other apps both used Web RTC to establish a realtime video conference between a user and a business via Web sites, using AT&T Web RTC APIs. “Sitter” is for care-givers in the home. It enables a parent to advertise for care givers. The applicant can record a personal video interview for the parent via a Web site. When the selected sitter gets to the home, the app connects to AT&T Digital Life, to enable or block access to rooms in the house, as enabled by the parent. “Host Magic” was for a home owner renting a property. Potential renters sign up, and the property owner receives an email notification that there is an applicant waiting. Similar to ‘Sitter,” the property owner can interview the applicant and grant access only to desired parts of the property. Telcos will win the long-term battle of communications, because they place the network itself at the center of their business, not the delivery of paid content – as cable companies do. In other words, AT&T’s product is its network, and it is AT&T’s strategic interest to rally as many developers around it as possible. Just as Apple began doing in 1990 with its Worldwide Developers Conference (WWDC), and Microsoft with its Professional Developers Conference (PDC) in 1992. Previous articleGoogle Glass experiment ends. What did it really mean? Next articleWill Windows 10 signal a new willingness to play nice?